Dubai, UAE. January 10, 2018: Malabar Gold & Diamonds, one among the BIG 5 jewellery retailers globally, is opening 11 new showrooms across six countries in one single day – Friday, January 12, 2018 – including eight in the Gulf region, taking the total number of outlets to 208 spread across nine countries. This is for the first time that an Indian jewellery retailer has been opening such a large number of showrooms spread across six nations in a single day. The new showrooms would be located in Al Khail Mall, Al Hazana Lulu, Al Buhaira Lulu, Sahara Centre, Ajman City Centre in the UAE, Mall of Qatar, Lagoona Mall in Qatar, Muscat City Centre in Oman, AMK Hub in Singapore, Ampang Mall in Malaysia, and Warrangal in Telangana,India. “The opening of 11 showrooms in a single day across six countries reflects our strong conviction and confidence in the overall growth of the gold and diamond sector, despite challenging circumstances in certain markets. We are getting wide acceptance in the global market place. This is also one of the reasons we are expanding our global presence. Our core business values such as adherence to transparency, honesty, quality along with our value added services, product designs that suited to every class of customers’ taste cutting across age group are the key factors that give us global acceptance. 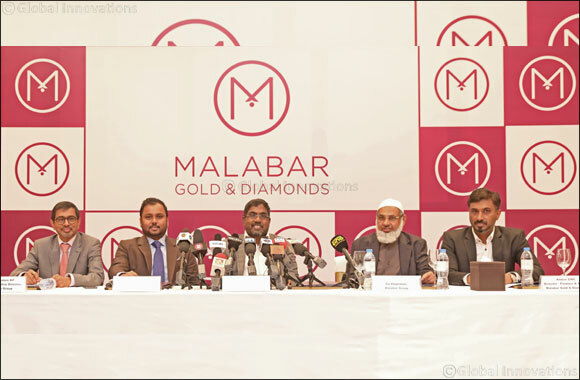 ” MP Ahammed, Chairman of Malabar Group, told the media at a packed press conference in Dubai. Currently, Malabar Gold & Diamonds has 197 showrooms of which 90 showrooms are in India and other 107 showrooms abroad. The rapid expansion of showrooms across geographies is part of the Group’s strategy to fast expand its global footprint. In FY2017 alone, Malabar Group has opened 27 showrooms across nations. “Despite the bull-run of crypto-currency, introduction of GST in India and VAT in UAE and Saudi Arabia, we believe that the gold and diamond trade will sustain growth in the long run and will remain as the best commodity for investment and as a saving instrument in addition to being used as jewellery.As consumers adjust to the new tax regimes in different countries, we believe, the market will record stronger growth as people adjust their budgets for ornaments.” added Abdul Salam KP, Group Executive Director of Malabar Group. The upcoming showrooms of the group are atAbbasiya (Kuwait),Mannarkad, Mall of Travancore (Kerala), Forum Mall – Bangalore (Karnataka), Himayat Nagar - Hyderabad, Kondapur -Hyderabad, Karim Nagar (Telangana), Noida (UP), South Extension (Delhi), Vashi - Mumbai, Thane – Mumbai, Kolhapur (Maharashtra), Rajkot, Surat (Gujarat) and Ludhiana (Punjab). In India, the company currently operates manufacturing units in Kerala, Tamil Nadu, Karnataka, Telangana, Maharashtra,West Bengal and in Saudi Arabia, Qatar and UAE. Asher O, Managing Director - India Operations of Malabar Gold & Diamonds, said, “The group is planning to set up more showrooms as well as manufacturing units in the country, eventually generating more employment opportunities and enhancing initiatives like 'Make in India’ being implemented by the Government of India. Malabar Group believes that the most successful companies are those which integrate sustainability into their core business. The group is always proactive when it comes to CSR activities right from the inception. The key focus areas of the CSR initiatives of Malabar Group are in the areas of Health, Education, Women Empowerment, Housing and Environment. The organization has kept aside 5% of its profit for the CSR activities in all the regions that they operate. The group, which currently has showrooms across GCC, India, Malaysia and Singapore undertakes several welfare activities with the association of like-minded organizations in the respective regions.